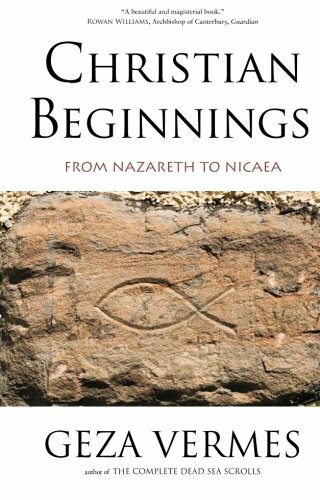 Christian Beginnings represents the final work of an extremely prolific scholar who passed away in 2013. His life journey was an interesting one, moving from a (non-practicing) Jewish background through a Catholic seminary, only later to leave and return to his Jewish roots. Vermes obtained a doctorate in theology from the Catholic University in Louvain in 1953 and taught in England, eventually becoming a professor of Jewish studies at Oxford. His writing focused on several areas of religious history. Vermes was considered an expert on the Dead Sea Scrolls and wrote several books about Jesus and the early Christian church. This book follows his general approach to the Bible and church history. In keeping with much modern scholarship, Vermes does not see the Bible as being divinely inspired, but as a collection of writings over the centuries whose reliability is questionable. This approach allows him to pick and choose what he wishes to consider as authentic teachings and events. Unfortunately, it also allows him to dispense with the heart of the Christian faith and to dismiss most of the material in the New Testament. One intriguing aspect of Vermes’ take on Jesus is the comparison of Christ to the charismatic prophets and leaders of the Old Testament and to modern-day Pentecostals. To Vermes, “charismatic” does not mean a strong personality that can attract others. He sees the term as designating the practice of certain spiritual gifts (such as those outlined in I Corinthians 12, for example). These spiritual gifts that Vermes refers to are exorcism (casting out of demons), healing, and prophecy (both the foretelling of future events and the declaring of God’s word). Vermes recounts examples of these gifts in both the Old and New Testaments , implying that he believes they actually occurred. Since he dismisses so much of the Bible narrative on other grounds, there almost seems to be a contradiction in his approach. Of interest to church historians is the coverage of the development of the early church. Vermes tries to distinguish three streams of early theology: the synoptic gospels (Matthew, Mark, and Luke), the writings of the apostle John, and the writings of Paul. Instead of looking at reconciliation of these streams, it seems that he wants to put them in opposition to one another. He also indicates his lack of acceptance of the authenticity of many of the New Testament materials, which would further complicate development of a coherent picture. Vermes spends about half the book analyzing the writings of the early church fathers and leaders down to the time of Constantine. This period was definitely one of debate and controversy (and a certain amount of power struggle). Here we see a thorough analysis of the documents in an attempt to clarify how certain doctrines were developed and analyzed. Vermes draws on some non-canonical writings such as the Didache and the Epistle of Barnabas (both dating before AD 200) and a number of the writings of early Christian thinkers to bring us a picture of the evolution of some basic doctrines. The thrust of the book is to develop the idea that a somewhat obscure first century Jewish prophet (Jesus Christ) somehow developed a following that led to Him being declared the divine Son of God three centuries later. It is not a new story (and certainly not in keeping with the New Testament scriptures and traditional Christian doctrine), but an interesting and challenging read nonetheless.